Many people are of the opinion that art is unimportant, yet it has been with us for thousands of years as evidenced in cave paintings and rock art. In today's technology-driven medicine, art is being used in novel ways such as in therapeutic programs and teaching medical students how to be better doctors. Studies show that incorporating the arts in our healing strategies can save money and improve well-being and experience of both the patient and physician. Art therapy programs include music and song, dance and movement, writing, drama, poetry and other approaches that use one or more arts modality to promote healing. I once read a case of a young boy with severe spasticity who always bolted around the room when it was time to give him some injectable medications. The doctor in charge of the patient had learned from experience that music could be used to relieve a child's fear and anxiety, be a distraction from pain, provide comfort, and increase the likelihood that the child would be cooperative during a medical procedure. So, on that particular occasion, he had called, "We need a musician stat." The patient was scheduled to receive a series of painful injections of botulinum toxin and the doctor knew that getting the boy to cooperate was always a challenge. Because art had been incorporated in the healing strategies of patients in that hospital, fulfilling the doctor's request as not a problem. What was unique about the doctor's request was not that he had called for live music to reduce anxiety and get the cooperation of the child for the dreaded injection but that he had called for it "STAT" i.e., urgent. Stat requests are usually reserved for blood work, medications and X-rays. Art to enhance traditional healing practices is being incorporated more into the routine therapeutic protocols. For example, it was found that using music therapy when preparing children for cat scans significantly reduced use of sedative medications, overnight stays, nurse time, and resulted in a cost savings of $567 per procedure. It also decreased the need for repeat CTs because of poor-quality scans. Researchers in the US estimate that extrapolating those numbers to all pediatric CT scans could result in potential savings of $2.25 billion per year. Such findings support the financial saving for adopting arts programming in health care. But besides the financial savings, art has other benefits. Music and song have been used as an alternative means of communication for those recovering from post-stroke aphasias. There are programs whereby patients in various settings create art to increase their sense of control, distract them from pain, decrease their stress level and blood pressure, and provide an outlet for emotional exploration and expression. Other artistic mediums such as storytelling has been noted to improve the quality of life for cancer patients, increase lung function associated with asthma and reduce symptoms and doctor visits. 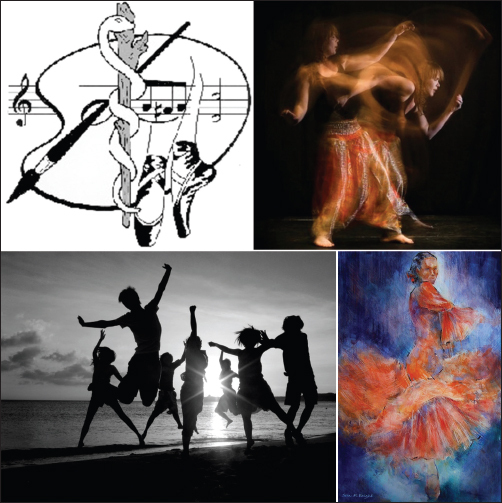 Another artistic channel that has been beneficial to patients is dance. Dance is one of the best ways to get people moving, hence reducing inactivity. A campaign in the UK found that people responded better to the message, "Dance makes the heart grow stronger" than to "Exercise makes the heart grow stronger." An article from the New Engl J Med in 2003 showed that dance delayed the cognitive decline associated with Alzheimers's disease. In addition, dance enhances social engagement, which is important to health and well-being. A body of research has found that health care environments such as design of building and lay-out of room are important for the well-being of patients. Designs that incorporate views of the natural world make patients' hospital experience less stressful, less anxious, require less medication, and are ready for discharge earlier. Other art mediums that have been used to improve patient well-being are drama and poetry therapy as well as reading and writing therapy. Many of these were originally intended to improve emotional health of patients but more and more they are proving to have other therapeutic benefits as well. Therefore, physicians should consider incorporating the arts in medicine. DeLoach Walworth D. Procedural-support music therapy in the healthcare setting: A cost-effectiveness analysis. J Ped Nursing 2005;20:276-84. Wood B. CT scans and radiation exposure. AAP Grand Rounds 2008;19:28. Schlaug G, Norton A, Marchina S, Zipse L, Wan CY. From singing to speaking: Facilitating recovery from nonfluent aphasia. Future Neurol 2010;5:657-65. State of the Field Committee State of the field report: Arts in healthcare 2009. Washington, DC: Society for the Arts in Healthcare 2009; p. 19. Available at: www.thesah.org/doc/reports/ArtsInHealthcare.pdf. [Last accessed on 2011 Jun 13]. Morgan N, Graves K, Poggi E, Cheson B. Implementing a expressive writing study in a cancer clinic. Oncologist 2008;13:196-204. Bray M, Theodore L, Patwa S, Margiano S, Alric J, Peck H. Written emotional expression as an intervention for asthma. Schs 2003;40:193-207. Pennebaker J. Writing about emotional events: From past to future. In Lepore SJ, Smyth JM (Eds.) The writing cure: How expressive writing promotes health and emotional well-being. Washington, DC: American Psychological Association 2002:281-91. Verghese J, Lipton R, Katz M, Hall C, Derby C, Kuslansky G, et al. Leisure activities and the risk of dementia in the elderly. New Engl J Med 2003;348:2508-16.